We drove around a little bit last Wednesday around Las Vegas. I am really amazed how this land has a lot of improvements. Being a desert before, this city is now fully developed. Being the "Gambling City of the World", how wonder that this city is more alive during the night because it is not so hot at this time!! this is just my little update for today!! hope to see you always here!! Have a great Tuesday to all of you esp. to all my friends out there!! Sorry if I am not able to visit you one by one....if given the chance, I would aLWAYS love to do so!! bye bye for now!! 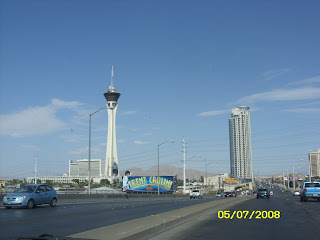 that's the Stratosphere, considered to be the tallest building in Las Vegas...want to go up there, hopefully this week! !